Earlier this year, I was invited to write an article for ISTC Communicator, the journal of the Institute of Scientific and Technical Communicators (ISTC). This week, the article was published. Here is a reproduction of the article in its entirety. After a short search, I was able to find a job as a project manager in the same organisation. I moved out of the world of technical documentation entirely, assuming that I would never go back. I took on my new project manager role with vigor and assumed that I was at the beginning of a new and exciting career path. It did not take long for me to realise, however, that I didn’t enjoy back-to-back meetings every single day, and that I did not thrive in the environment of navigating and closing complex negotiations and dealing with constant conflict. Role-based output. Using Flare’s extensive single-sourcing capabilities, I was able to deliver role-based output for my most complex projects, without duplicating any content in my source files. Multiple output formats. I was able to deliver any format that my team needed. User guides, online help, mobile help, EPUB, and CHM were all formats that I delivered from Flare in my first six months on the job. Content styled for its need. Flare offered me complete stylistic control over my content. Flare uses standard CSS (cascading style sheets), and learning CSS enthralled me. I loved walking into review meetings with content that looked modern and professional. Even more, I loved being able to say ‘yes’ when I was asked if we could make a stylistic change. 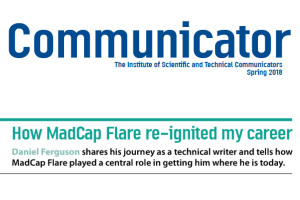 Learn more about my MadCap Flare Training and MadCap Flare Consulting offerings. Want to talk about life and career? Just getting started in the industry? Have a class you’d like me to talk to? Feel free to contact me. I’d love to hear from you.